ELMHURST, N.Y. (WABC) -- Six men have been arrested for possessing more than 3,000 pounds of marijuana. 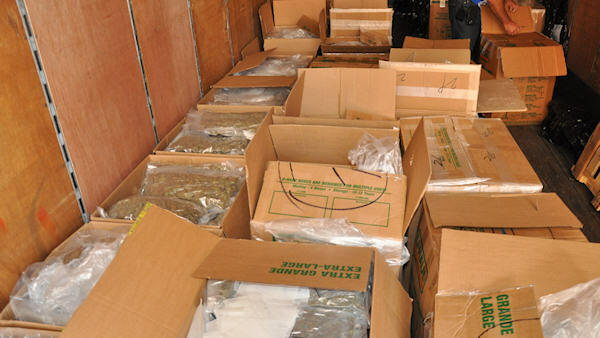 Members of the DEA's New York Drug Enforcement Task Force discovered them transferring cardboard cartons containing the drug from a tractor trailer parked in Elmhurst, Queens, to two smaller vehicles early Monday morning. In addition, it is alleged that the suspects possessed between $200,000 and $300,000 in United States currency. DEA Special Agent in Charge James Hunt said, "The seizure and arrests surprised us just as much as it surprised the defendants when arrested. However, it shows that law enforcement agents and officers possess the keen ability to spot the things that don't belong. In this case, the New York Drug Enforcement Task Force spotted and seized over $3.5 million dollars worth of marijuana that was destined to be trafficked throughout NYC." District Attorney Richard Brown said, "The defendants are accused of removing cartons of marijuana stacked six feet high from a tractor trailer across the street from the Good Fortune Supermarket in Elmhurst when confronted by law enforcement. The defendants, who hail from California, Canada and Brooklyn, made a mistake by stopping in Queens County to distribute their illegal wares. They now face serious drug charges." Police Commissioner William Bratton said, "I commend the work of the Drug Enforcement Task Force for intercepting this large amount of illegal drugs before it could be distributed onto the streets of New York City. The NYPD is committed to working with our law enforcement partners to protect the quality of life for all of our communities." State Police Superintendent Joseph D'Amico said, "Because of the heads-up police work by members of the New York Drug Enforcement Task Force, we have taken an enormous amount of marijuana off the streets and put the six men responsible in handcuffs. I want to thank our local and federal partners for their hard work and dedication to slowing the flow of illegal drugs into New York State." They will each be charged with first-degree criminal possession of marijuana. If convicted, the defendants each face up to five and a half years in prison.